Did you hear the news? Break out your garlands and your seasonal decor, you guys! Because all of the best holidays are just around the corner! And with those fun and festive celebrations, you might find yourself in a position to actually play hostess this year? Well, if you're like me, and you love entertaining, then please tell me that you've seen the beautiful collection of party goods designed by Laura Hooper Calligraphy? Not only have I had the chance to take Laura's Calligraphy Workshop (after years and years of being a huge fan of her lettering), but I also have had the chance to incorporate her party pieces into the styled shoots and events that I've personally designed. And so today I thought it would be fun to share some of my favorite items from the Laura Hooper Calligraphy collection. From Halloween to Thanksgiving, to Christmas and New Year's Eve, there really is so many fun and festive ways to add a bit of charm and personality to all of those upcoming holiday parties of yours. So many fabulous ways to add a bit of spooky flair to your parties! 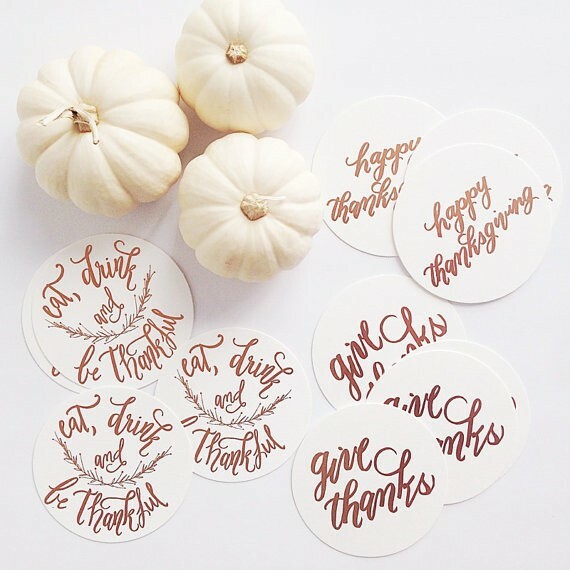 How cute are these "give thanks," lettered pumpkins? And these Thanksgiving inspired coasters? Be still, my calligraphy-loving heart. Yes, you can actually buy a little white pumpkin, hand lettered, that says, "cheers!" And can we just talk about how darling this 'Happy Thanksgiving,' signage is? I don't know what it is, but I just love to handmade! So personal, so charming, so sweet. Take this hand lettered wrapping paper, for instance! Oh, and who isn't loving these adorable "Merry Christmas," napkins?! And these fun and festive drink stirrers? Pop, fizz, clink, m'dears! Tis' the season! Such sweet signage, if you ask me! Coasters this cute? Where do I sign up? Mark me down for a yes, yes, yes! And if NYE isn't a reason to add a lil' festive flair to your parties? Then I don't know what is? So there you have it! I hope you enjoyed taking a peek at a few of my favorite items from the Laura Hooper Calligraphy collection! From drink stirrers to coasters, and everything in between, there's no mistaking my love for calligraphy, and I simply can't get over all the gorgeous ways you can incorporate lettering into your holiday celebrations! 20 Comments " Handmade Holiday Goodies from LHCalligraphy "
Love this! I'm super excited for fall! What kind of pen did you use on that white pumpkin? Wanting to do this for my front porch! What pen did you use on the pumpkins? Great information i love it so much good job and good luck for the next bro! MSNBC is the computerized TV and Satellite station guaranteed by the NBC comprehensive social event. The channel is the sister of the social event of eight others which fuse CNBC, CNBC World and six others. MSNBC displaced America's Talking (1994-1996). It fundamentally covers the news, sees, streams endeavors and political emotions and reasonable talks both in America and Worldwide. The channel's name was gotten from the IT mix Microsoft 'MS' and the 'NBC' of National Broadcasting Company.